my own life I have by God's mercy blurred the lines between church ministry, community service, business and family life so that all is ministry serving God each day. My background is quite diverse in experience. I was raised by both parents in a strong christian home in San Diego. My parents, who are still married to each other, (thanks mom and Dad what a legacy) raised us at Shadow Mountain Community Church in San Diego. I am happily married to my wife Lisa, the love of my life, we have been married 29 years. We have 3 kids that all love the lord and have been a heavenly blessing from God to us. Their names are Joshua, David and Rachel. I spent 8 years working as a construction foreman in San Diego running crews of up to 23 men. 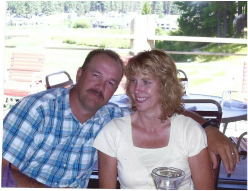 Lisa and I have owned a construction company in Plumas County for 11 years and have also owned a window covering company for 22 years also in Plumas County. I was president of a local youth sports organization for 8 years. I coached American Football 21 years (head coach 18 years). I retired from coaching high school football last year. I am currently in my 6th year as a head coach of a high school track team also here in Plumas County. A few years ago I founded a local organization to work on improving the relationship between local law enforcement and the citizens of Plumas County. I served as a deacon at one of our previous churches for over 10 years. I have experience in marriage counseling and abundant experience in discipleship and counseling others one on one. I led a small group study at one point for over 8 years. I was also a local Christian School board member for approximately 8 years. I believe pastoring is primarily loving people and every pastor should preach to his own heart first to avoid his own soul being lost and also to avoid living a life full of hypocrisy(1st Tim.1:19). I believe a pastor is called not only to equip the Body of Christ for ministry but to shepherd with deep love and commitment. If this type of servant leadership sounds good to you then I would like to invite you to pay us a visit at Chester Baptist Church on a Sunday morning. I would enjoy meeting you. To read Pastor Daniel Hanna's testimony, please click on the link below.